Soon to be her favorite! 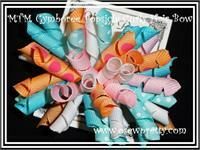 Bursts of curly ribbon securely attached to our original velvet covered Clipie, French Barrette or Ponytail holder. Available in two, three, even six different colors of your choice ribbon to create a custom curly korker hair bow or headband. You can rest assured that your curls will stay curly and the ends won't fray. That's because O'Sew Pretty professionally seals every end without using toxic chemicals. 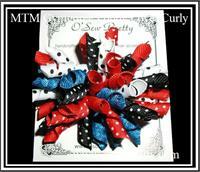 Attractive and long-lasting hair bows, hair accessories and hair bow's on headbands from O' Sew Pretty! Perfect for a child with any hair texture. Create your own design by choosing up to 6 different colors. Perfect for the hair challenged child. Create your own design by choosing 1, 2 or even 6 different colors. Ideal for any hair texture. Stays bouncy and full through lots of play. 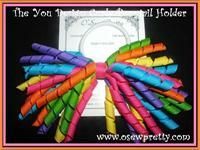 This bow is perfect for cheer teams, spirit day, or just for fun! Create your own design by choosing 1, 2 or even 6 different colors. 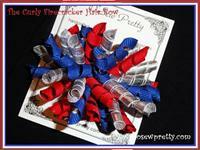 Clip on the Firecracker Bow for the little "firecracker" in your life! 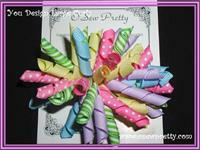 Available with silver or gold accent ribbons and in 3 different sizes. 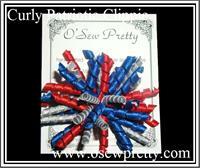 Swirls of red, white and blue satin curlies complimented with silver lame' add just the right touch of sparkle to this bow. 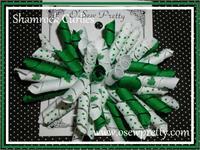 A Hair bow fit for the Irish Princess! This hair bow is a burst of Safari Fun! Great hair bow for a trip to the Zoo! Available in 5 Great Sizes! 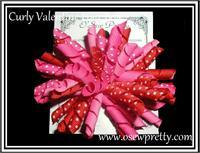 This hair bow is a burst of Valentine Fun! This pint size hair bow is perfect for Toddlers and Pig Tails. There available on a Pony O' too!. 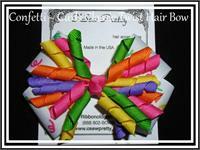 A perfect made to match corker hair bow. There available on a Pony O' too!. 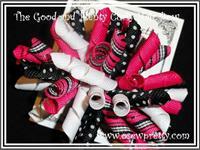 A designer stripe curly surrounded by black stripe and pin dot, white and shocking pink. This hair bow is perfect for Toddlers and Pig Tails. The word Princess and pictures of crowns on white curls then accented in lime juice and pink .This hair bow is perfect for Toddlers and Pig Tails. Nothing screams summer like this designer stripe curly surrounded by white,apple pin dot, and hot pink swiss .This hair bow is perfect for Toddlers and Pig Tails. Nothing screams summer like turquoise, white and designer blue stripes. This hair bow is perfect for Toddlers and Pig Tails. Nothing screams summer like hot pink, white and designer hot pink stripes. This hair bow is perfect for Toddlers and Pig Tails. 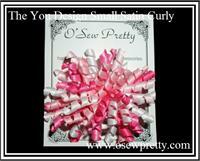 A red, black and tan stripe ribbon surronded by all matching ribbon colors. This hair bow is perfect for Toddlers and Pig Tails. Nothing screams summer like this designer flower print curly surrounded by maize,apple,Orange, aqua and shocking pink .This hair bow is perfect for Toddlers and Pig Tails. Perfect for a child with any hair texture. Create your own design by choosing 1, 2 or even 6 different colors. Choose from any of the 14 different color pin dots and stripes. Shown in Regal purple. 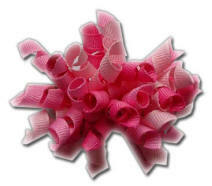 This hair bow is perfect for Toddlers on up to cheerleaders. Full of frosty snowmen curls in blue and then accented in pin dots and solid grosgrain .This hair bow is perfect for Toddlers and Pig Tails. This hair bow is a burst of Denim Fun! Great hair bow to top off those denim jeans! Shown with accent color pink on our original velvet covered clippy. This hair bow is a burst of Wildcat Fun! Great hair bow for a trip to the Zoo! Shown in medium on velvet covered clippie Available in 4 Great Sizes! 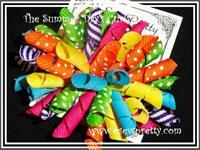 This hair bow is a burst of summer Fun! Great hair bow for a trip to the Park! Available in 4 Great Sizes! This hair bow is a Pop of Daisy Fun! Made to match hair bow for Pop Of Daisy clothing line. Available in 4 Great Sizes! Nothing screams summer like this designer dots and stripes curly surrounded by maize, turquoise and shocking pink .This hair bow is perfect for Toddlers and Pig Tails. Nothing screams summer like this designer made to match popsicle clothing line. This hair bow is perfect for Toddlers and Pig Tails. Nothing screams cute like this designer made to match poppy love clothing line. A navy, white and apple green stripe surrounded by apple, navy pin dot, white, and solid navy. This hair bow is perfect for Toddlers and Pig Tails. Wonderfully fun and festive, our birthday bow will add the final touch to the Birthday Girl's party dress.